After Justice Anthony M. Kennedy’s retirement, Democrats and Republicans waited anxiously to find out who would be Trump’s presidential nominee for the vacant Supreme Court slot. On Monday, July 9, 2018, Judge Brett M. Kavanaugh was announced as the nominee to be considered by the Senate. 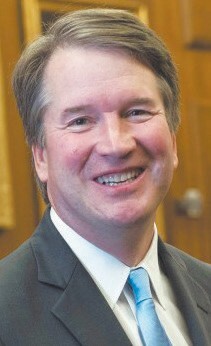 Kavanaugh is currently serving as a judge of the US Court of Appeals for the District of Columbia Circuit. He is a conservative pick, but he has controversy on both sides of the aisle. Normally at Supreme Court confirmation hearings, it is off-limits to ask a presidential nominee how they will rule in certain cases, but with the Democrats increasing concerns about the balance of the Supreme Court shifting steadily conservative, many feel as though it is necessary for the nominee to share their views on serious legal issues before his confirmation. Kavanaugh has interesting stances on some controversial issues including abortion, religious liberty, separation of powers, and the second amendment. Both Democrats and Republicans will be tuned in to the confirmation hearing to see how, or if, Brett Kavanaugh will answer questions related to his future rulings if he is confirmed to the court.